Bart Defoort was born in Bruges,Belgium on February 10, 1964. He grew up in a musical family,his father being a classical Music teacher, Choir leader and his oldest brother Kris, who became a jazzpianist and composer of contemporary Classical and Jazz Music. 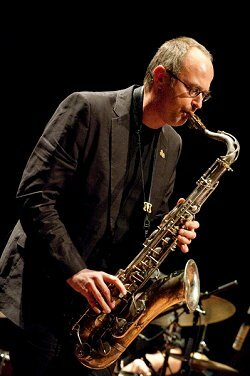 Bart studied and graduated at the Royal Conservatories of Ghent and Brussels with Steve Houben and attended Summer Workshops with John Ruocco and Joe Lovano. In the beginning of the nineties,he moved to Brussels and became very active on the Belgian scene from then on. As a Bandleader,Bart has recorded 5 CD's with mostly original compositions in Quartet or Quintet settings.He has been playing with his groups on the Major Belgian festivals (Jazz Middelheim,Jazz à Liège,etc..) and podia,as well as in some other European countries like Holland,Germany & France. Bart has also played and recorded with Octurn , K.D. 's Basement Party ,Streams (as co-leader with Diederik Wissels ), Jean Warland's Sax No End, Bart Defoort & Emanuele Cisi Quintet, Ernst Vranckx/Kenny Wheeler Quintet, Mal Waldron & Chris Joris Sextet, Amit Heri & The Karnataka College Of Percussion, Olivier Colette Quartet, Bart Quartier Quintet, Marbix Busstra,Paolo Radoni,Richard Rousselet,Ivan Paduart,,Victor Da Costa, etc...and has been touring in China,India and Canada. Bart is teaching at the Royal Conservatory ( School Of Arts ) in Ghent, Belgium.